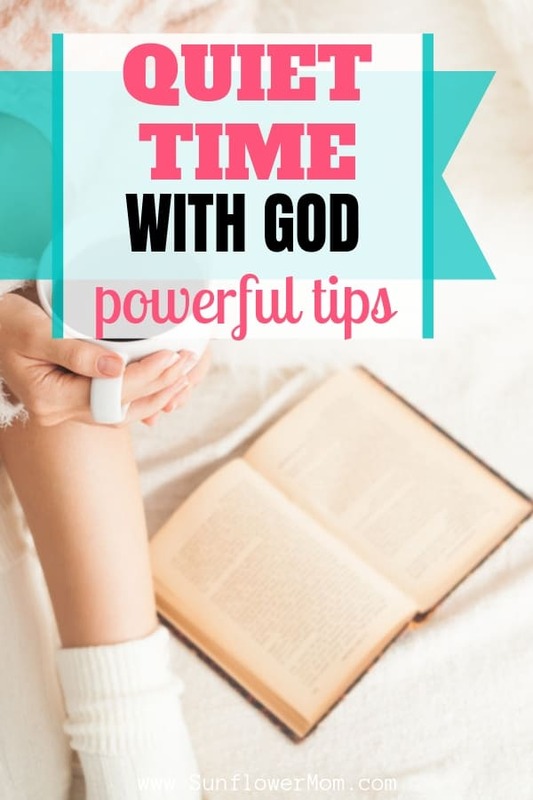 Inside: tips to establish and enjoy a quiet time with God each morning. Whether you’re wanting to start a new habit of meeting with God in quiet each day or looking for new ideas and resources, you’ll find it here. Who has time in the morning? And if you do have time how do you stay awake and keep your mind focused? For many, the topic of quiet time with God is yet another tired conversation that is beyond reach. Something we feel we should do but don’t. But there is a reason everyone talks about it – spending time in quiet with God is rewarding, and it works. The key is making it work for you and God. Every relationship is different. Your quiet time doesn’t have to look like anyone else’s. To do that, you’ll have to experiment a little, explore different ideas and resources. A morning routine is challenging if you’re not a morning person. 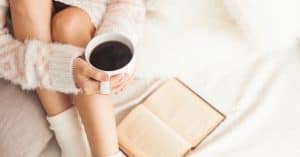 A couple of books can help develop a morning routine particularly for a non-morning person are The 5-Second Rule and Miracle Morning. The 5-Second Rule revolves around the premise you need to move your body within 5 seconds before your brain has time to talk you out of it. The 5-Second concept is also discussed outside of waking up in the morning. But it all began with waking up early using this concept for how Mel Robbins turned her life and depression around. The Miracle Morning involves a series of actions and events to make you into a morning person. Once you establish a morning routine of your own, you will look forward to it. Getting out of bed and sitting there in the presence of God and reading becomes your reward. If this sounds crazy, then you haven’t found your sweet spot yet. Enjoying your time with God is something that can take time. Be patient and try different things. If you’re a night owl, you may be tempted to push your quiet time with God to the evening. Your actions in the morning set the mood for the day. Adding a gratefulness component or diary to your morning routine will enhance your mood as well. You’re giving the Lord the first part of you. Giving God the end of your day is the other option. But first consider: How often at the end of the day do you say you’re going to read your Bible and how many nights do you have the energy? We’re usually too tired, or nothing sounds better than laying in bed and turning on some Netflix before sleeping. Once you’re in the habit of waking up early, you’ll want to find a routine you look forward to upon waking up. Start your morning with a walk around the block to get the juices flowing if you’re afraid you’ll fall asleep if you sit down to read your Bible or pray. Drink your morning coffee outside to wake yourself up. Find a blank notebook and challenge yourself to list out ten things you’re thankful for each morning. Find a Bible reading plan. YouVersion App has a ton of reading plans. Or check out SheReadsTruth for multiple plans. Or join the 6-week journaling plan here with weekly worship songs. Try reading the Bible in a year. Or there are reading plans that cover the Bible over two years if one year is too daunting. Another option is to listen through the Bible. The Bible Gateway App will read chapters aloud to you. Listen to the Bible and knit or drink your coffee. One year, I listened to the Bible while I sewed girl scout patches on to my daughter’s sash. I knew there was no way I’d stay awake reading through the Bible in the morning. But I could listen. 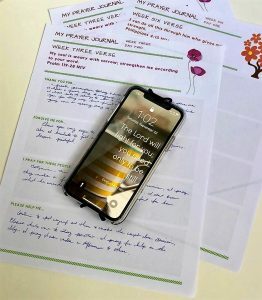 A more hands-on approach is Bible journaling which can be a more meditative time for you in the morning. To keep yourself on track while reading you can also try highlighting your Bible different colors for different meanings. Go for a walk and listen to the Bible app on your headphones. When summer begins, I wake up with the sun and take my coffee outside on a half covered back porch. Listening to the birds or the rain and no other noises (especially children) is a peaceful way for me to center myself before the day begins. I’ve found the following devotions to help create a quiet time. See if any of these, get your passion for spending time with God underway. Aside from reading your Bible every morning, listening and talking to God is an integral part of your morning as well. Beth Moore’s “Whisper’s of Hope” of prayer book with instrumental to me to get started on my morning prayer journey. Jesus Calling by Sarah Young: this book has short devotions that seem to perfectly know what you’re going through each day as you read through them. It’s written as if God is speaking directly to you. 100 Days to Brave by Annie Down: These are very short devotions that speak to being brave with a small challenge for the day. 100 Devotions to Know God is Holding You Close by Lysa TerKeurst: This book consists of daily devotions for 100 days that are Christ-centered. One Line a Day: A Five-Year Memory Book: this is a fun, small journal that every day for five years you write a few lines of what happened that day for your family. At the end of five years, you can see at a glance for one day everything you did for five years. I’m on my second year now, and it’s fun to see what we did exactly one year ago as I write for the current day and thank God for what he’s done in the past. My Prayer Journal a Three-Month Guide to Prayer Praise and Thanks: I’m using a simple paper prayer journal right now. This prayer journal allows me to write down a verse of my choosing (usually taken from Jesus Calling) then space for me to write what I would like God to teach me today, what I’m thankful for and any prayer requests. Write your prayers out to keep yourself accountable for praying and not getting lost inside your head and thoughts. Try to wake up before your children to have 20 to 30 minutes of quiet time to yourself. Occasionally one of my children will wake up during this time and try to sit next to me and talk to me. I usually tell them I’m having my quiet time now or I’m reading my Bible now. Incorporate prayer. Your prayers can be as simple as you want. Talking and listening to God is where you will find your relationship grow. It’s good for our children to know and to see when we take time out to spend time with God. My children are more than welcome to sit next to me and read quietly, but I do not stop my time. If I reschedule it for later, I know it won’t happen. There’s no shortage of resources out there for you to have your own quiet time. It’s all about finding something you can stick with. Time with God each morning to center yourself is something you’ll come to look forward to each day. Get started on your journey today with this 6-week Prayer Journal. The journal leaves space for you to record your prayers each day and memory verse for each week. You’ll receive a worship song that corresponds with your memory verse to enhance your worship time and screensaver for your phone. This post is part of a series, The Passion Project Series. The series is designed to help single moms find their passion through stressful solo parenting. All moms who feel they have lost themselves in parenting and life are welcome. Find the index here.